The eGO Cycle is an electric cycle that travels silently, pollution free and as fast as 20 miles per hour, for as far as 25 miles on a single charge. This unique electric cycle has an on-board charger which allows “refueling” at any outlet for 10 cents worth of electricity – the eGO Cycle costs less than half a cent per mile to drive. Given the price of gas these days, the eGO electric cycle is a practical, environment-friendly, green vehicle for daily transport needs! It’s a great way to get to work or school, going out to launch or just a day at the beach, getting the groceries or just picking up the mail – this electric bicycle can transport anything you don’t need a whole trunk for, like a couple of bags of groceries, a briefcase, laptop, books, whatever. 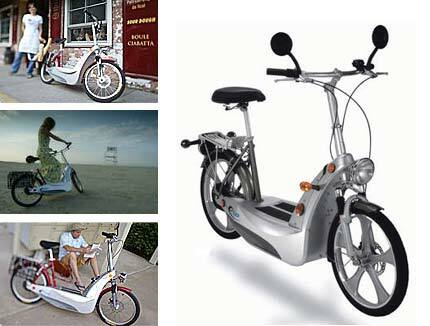 The eGO Cycle is safe and simple to operate for people of all ages, and it is the only electric bike that meets National Highway Traffic Safety Administration (NHTSA) safety requirements. I’m trying to buy a controller for the Ego bicycle and can’t find any place that sells them. Got any ideas? ?